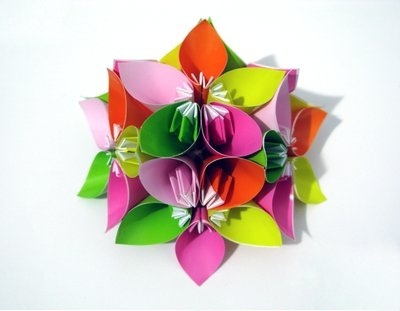 Origami is a traditional Japanese art of paper folding. It involves creating shapes from paper by folding them in particular ways to create different interesting shapes. Imagine how much fun you can have planning a wedding with an Origami theme in mind! Whether you want to save money, opt for something different, or you are just a crafty person who wants to reflect that quality in your own wedding, Origami is a very elegant and original way to decorate your wedding, from your invitation cards down to the tiniest detail! Take a look at this stunning origami engagement theme right here! Start by picking your favorite colors to match your wedding day. The shapes you can select from are endless; flowers, birds and cranes to actual bride and groom puppets. You can add Origami flowers to your bouquet, centerpieces, and even make a boutonniere for the groom as you can see in these pictures. Cranes are beautiful birds, they are considered to be a symbol for longevity and good health in Asian countries. It is also believed that cranes mate for life; what a beautiful sentiment to incorporate into your wedding. Butterflies are always great for weddings, have you read our Butterfly Wedding Theme article? In China, two butterflies flying together are a symbol of love. Including Origami in your invitation is also a great way to give your guests an idea of your wedding theme from the very beginning, and will also make it more memorable. Would you consider having your cake, cupcakes and even your buffet decorated with Origami? Why not! You can even add Origami to your giveaways!